Cast Iron vs Carbon Steel | What’s the Major Difference? When you decide to buy cookware (pots or pans), it is very important to identify and know the material used. There are so many materials used for making cookware. Two of the most popular materials used for cookware construction are cast iron and carbon steel. You may want to know the differences between Cast Iron vs Carbon Steel. Anyway, carbon steel still has a relationship with cast iron, but both of them have different characteristics, weaknesses, and strengths. You can check these following major differences between carbon steel vs cast iron. First of all, we can identify the difference between cast iron and carbon steel from the material. Cast iron has been used for thousands of years ago for making a wide variety of items such as tool making, construction, ornamentation, and even cookware. What is actually cast iron material? Basically, it is a kind of pure iron that is alloyed with carbon as much as 3 percent or more. In this case, when we compare it to carbon steel, the iron cast may have more carbon than carbon steel itself. In addition, you also need to know that cast iron is not malleable. In this case, you cannot use a hammer to shape it. Moreover, it is also considered as brittle metal which makes iron cast susceptible to breakage. What about the carbon steel material? Though the name implies carbon steel, the amount of carbon used on carbon steel is even lower than the cast iron. In this case, carbon steel only uses less than 2% of carbon. You may notice it when you distinguish between carbon steel pan vs cast iron. But, when we talk about innovation, carbon steel is considered a new modern invention that has been used to develop alongside aluminum, stainless steel, and steel since 18th centuries. Since it only uses less carbon and it is also not brittle, so you can just stamp, roll, and shape carbon steel compared to cast iron that is known harder. How to make cast iron cookware and carbon steel? Somehow, you may wonder the difference between carbon steel skillet vs cast iron or carbon steel pan vs cast iron in term of construction. Of course, both of these materials have each own way to construct a product. Firstly, we can identify how cast iron cookware is manufactured. Well, cast iron cookware begins with liquid metal or the iron cast is converted into liquid and then it is poured into a place, container, or mold. In this case, cast iron pan or skillet are actually made from a single piece of metal. Since the iron cast is very hard, it cannot be shaped directly without converting into a liquid. Meanwhile, it is different from the carbon steel construction when it will be shaped into a product. You do not need to convert it into a liquid to shape carbon steel and it usually begins with a sheet of metal which is already heated. When carbon steel is heated, then it will be shaped using a press machine to get the shape expected. You can also shape it using a hammer or other tools. Meanwhile, when making a pan, the handle will also be formed separately from the cookware construction and then it will be completed with a rivet for safety. 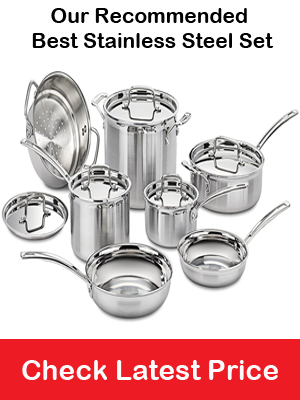 What kinds of cookware products are usually made from cast iron or carbon steel? Basically, both of the materials can be used to make any kinds of cookware products. For instance, the iron cast is usually used to manufacture muffin pans, loaf pans, grill pans, griddle, dutch ovens, and skillet. Meanwhile, the carbon steel is usually used to manufacture wok, paella pans, crepe pans, and skillets. In addition, you can also check the difference on the heft. The cast iron itself is known heavier than then carbon steel. A cast iron skillet with a size of 12 inches may weight 8 up to 9 pounds while carbon steel skillet may weigh 5 pounds. Which is one is better between cast iron vs carbon steel in term of heat distribution? Now, you know that cast iron wok vs carbon steel is different in the making process. So, you must think that the heat distribution is also different from one another. Anyway, when we talk about heat distribution, it seems that carbon steel has a better performance in distributing heat fast and responsively. Moreover, carbon steel can also get cold faster after cooking compared to cast iron. Meanwhile, cast iron can take a few minutes or slower to heat because of its thickness. Moreover, it is also relatively slow to get cold after the use. How to take care of carbon steel pan vs cast iron? Basically, there is no significant difference when dealing with care. After you use this cookware, you can just wash it using hot water or you can also use a scouring pad. You may use soap to clean it or you may not need it. Once you wash it with water, both of these cookware materials can dry easily and fast. You can keep this cookware in your kitchen cabinet or hang it on a rack. How long can you use carbon steel vs cast iron cookware? Somehow, you also do not need to worry about the durability. Both of these materials have the same durability. You can use it for years because it is made from a hard material that cannot be easily broken. But, if you ask which one is the most durable one between the cast iron vs carbon steel cookware, then the answer will be cast iron because it uses more carbon than the carbon steel. In conclusion, those are a few differences between Cast Iron vs Carbon Steel that you may need to know just in case you decide to buy this kind of cookware material. It seems that carbon steel cookware is better than cast iron in term of heating distribution. But, cast iron may be more durable than the carbon steel because it is harder.